Had an architectural shoot out at Lake Holiday today. What an awesome place to shoot. Gonna have to get back there some day to really explore. The pristine Lake Holiday in Frederick County, VA. | Order a print of this image. I like to shoot sunrises and sunsets. I’ve said this before. But after a while, as with anything, it gets harder and harder to shoot it differently. Granted, each sunset and each sunrise is different, but how do I create something unique. A big deal for a perfect composition is to have depth to your images and that’s done by introducing foreground elements. That’s kinda tough when your camera is 250 feet up in the air. I just wonder if I’ll get any backlash from this image because of how close I was to it. 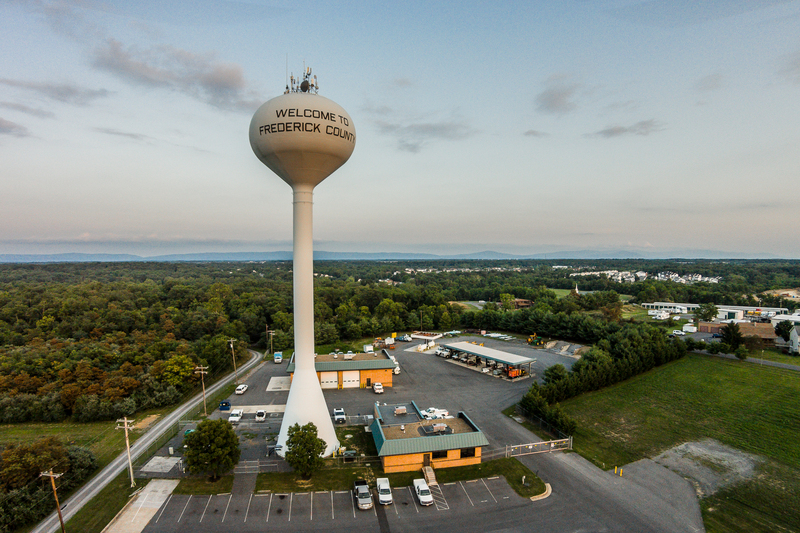 By the way, if you live in the Winchester-Frederick County area of VA (and maybe even if you’ve driven through), you’ve seen this water tower along I-81 at exit 310. What a great day for a triathlon! The FCPRD hosted the second annual youth triathlon this morning and I think it was a big success. I figured, at the beginning of the year, that if I wasn’t going to race this year that I would at least remain as connected to the sport as possible. And shooting all sorts of races from Ironman distance to local youth tri’s is how I’m doing it. Many more images to follow (and video at some point). The pool was actually inviting once the kids realized that the water temp was warmer than the air.